The mission must be deployed across the entire separatist-held area and along the border. 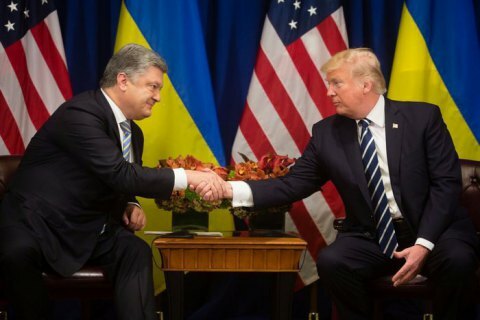 Following a meeting with US President Donald Trump, President Petro Poroshenko has said that the US administration supports Ukraine's call for a UN peacekeeping mission in Donbas. "The USA fully supported the proposal of Ukraine, my proposals declared already in 2015, on the deployment of peacekeepers with the UN mandate in the occupied territory. I would like to emphasise that the position of Ukraine is that the mandate must cover the entire occupied territory in eastern Ukraine, including the uncontrolled part of the Ukraine-Russia border," he said. "We agreed that our main goal is de-occupation, restoration of Ukraine’s sovereignty and bringing peace to the Ukrainian land as soon as possible. This is what I want as Ukrainian president. This is in what the key states of the world support us in," he said. On 5 September, Russian President Vladimir Putin suddenly expressed support for a peacekeeping mission in Donbas but said that its area of operation must be limited to the line of contact and that Ukraine must coordinate it with the Donetsk and Luhansk people's republics. Russia submitted a resolution to this effect to the UN Security Council. Russian Foreign Minister Sergey Lavrov said that UN peacekeepers should only protect the OSCE Special Monitoring Mission.